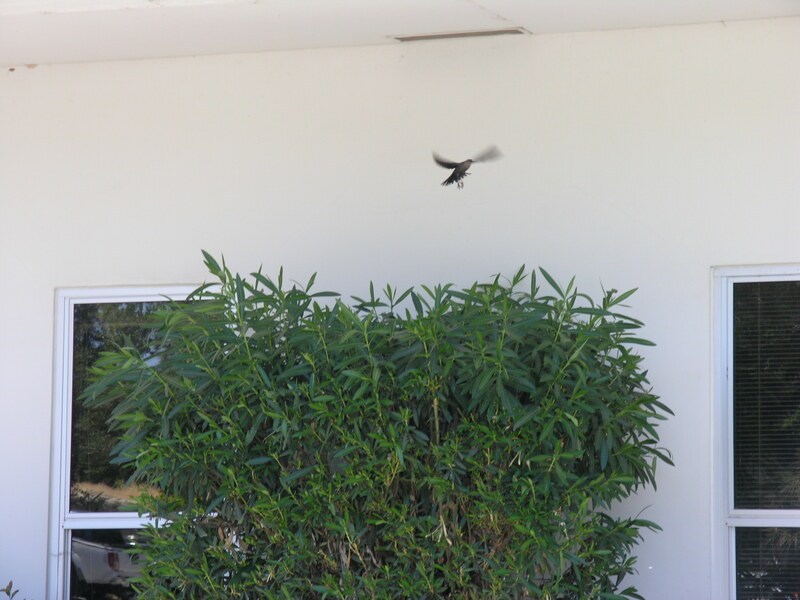 Female Brewer’s Blackbird in flight at the regional office in Rancho Cordova. If you live in the greater Sacramento area, chances are you’re familiar with the Brewer’s Blackbird. These birds require open ground to forage on and dense vegetation for nesting, which makes urban areas prime real estate for a Brewer’s Blackbird community. Our regional office in Rancho Cordova is no exception! We have a resident community of blackbirds year-round and currently we find ourselves at the peak of breeding season. Our parking lot has become a source of amusement for passive onlookers as well as a source of humiliation to those at the receiving end of the blackbird attacks. While this behavior will eventually wind down as the season progresses, we caution anyone brave enough to enter our doors – beware of the attack blackbird … he has a nest to protect. Spring is always a busy time of year for animals and the Wildlife Investigations Lab alike. Animals are not only becoming more active after a restful winter season, but many are also caring for young. Blackbird couples are monogamous and both the male and female will care for their chicks, typically having 1-2 broods a year with a clutch size of 3-7 eggs. During this time, the male is extremely territorial and will harass, dive-bomb, and chase anything that poses a threat … including people! Adult males are easily identified by their iridescent black plumage and bright yellow eyes. Adult females are a little more discrete and are a dull brown color with darker wings and tail. These colonial birds are very habituated to people and are commonly seen roosting, nesting, and feeding in urban and agricultural areas. 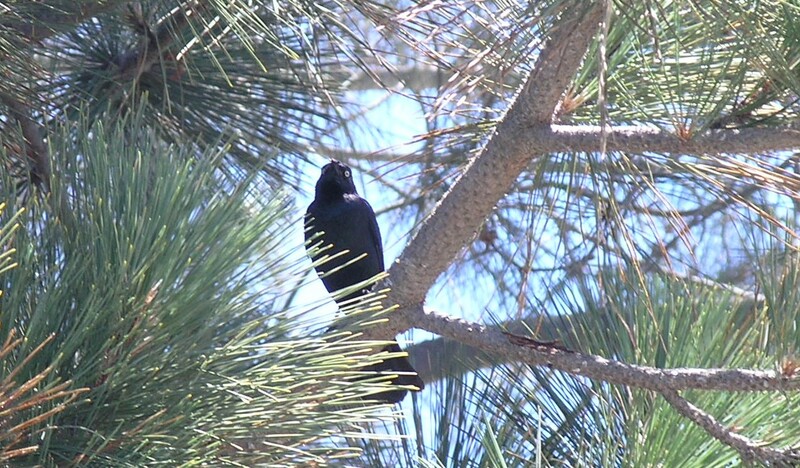 A male Brewer’s Blackbird keeps a vigilant eye on passers-by at CDFGs Region 2 Office in Rancho Cordova. 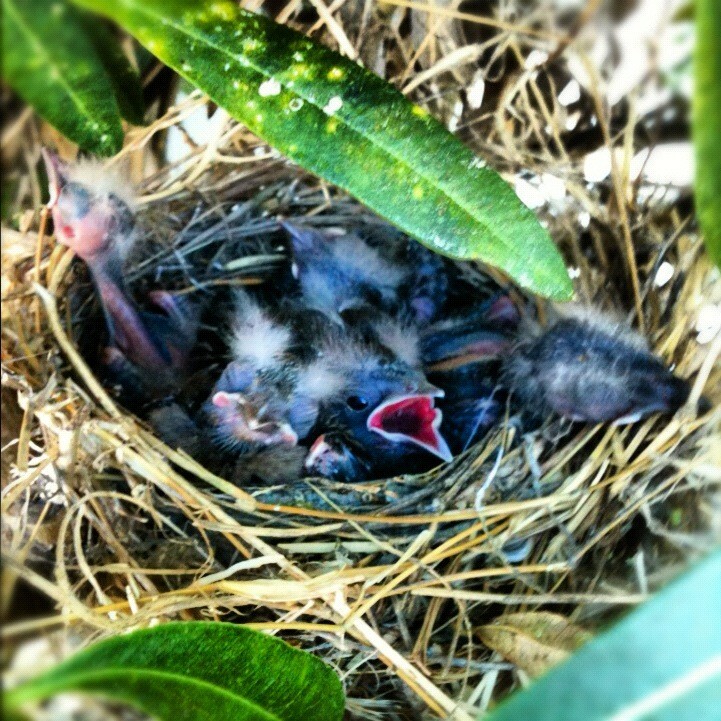 A nest of Brewer’s Blackbird chicks at the Region 2 office. Big Bear residents are being asked to help researchers learn more about the effects of mange in Big Bear’s population of western gray squirrels (link to press release). Mange is a contagious skin disease caused by parasitic mites that burrow into the skin of affected animals, causing intense itching, infection, hair loss and even death. Big Bear area residents can report sightings of healthy and sick squirrels and take a survey about their previous squirrel sightings on the website. This information provided by the public will help construct a picture of what happened to the squirrel population in the San Bernardino Mountains, determine whether or not mange is continuing to be a problem, and help track current population trends. In addition, this information will also help researchers determine whether conservation measures can be taken to prevent further losses of squirrels. 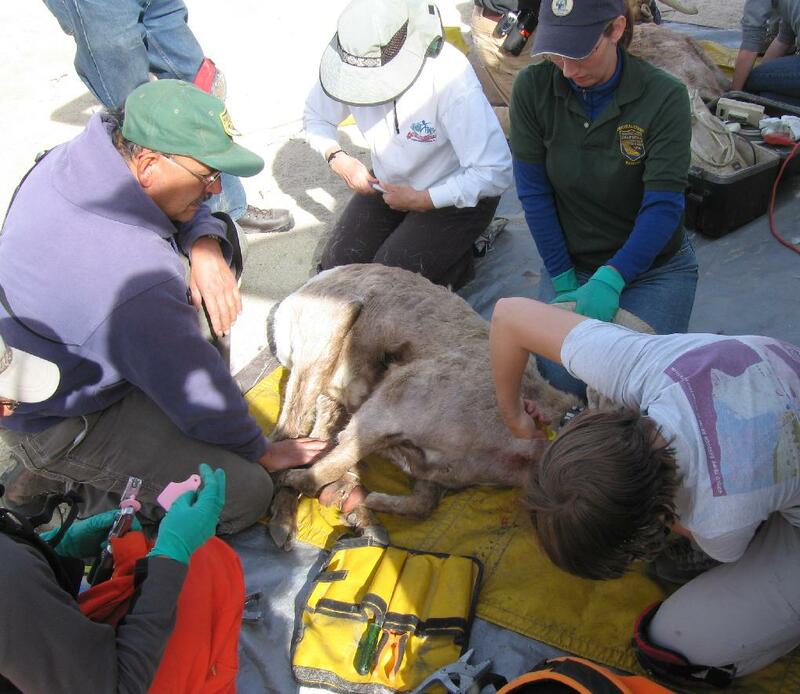 The Wildlife Investigations Lab participated in a deer capture in the Mojave National Preserve in March 2012. This project is looking at the impacts of the provision of water on deer health, reproduction and survival in the desert. The Wildlife Investigation Lab provides and maintains a temporary animal holding facility and provides veterinary care for confiscated, displaced, injured, or nuisance wildlife. When animals come to us, they’re often stressed because they are not in their natural surroundings. We make every effort to improve or enhance the captive animal’s environment. One of our projects for supporting animal husbandry is to provide hammocks for each of the critters that are housed in our facility. We have had hammocks for the critters to rest in for quite some time, however, the bears and lions wore them out. With a little time and research, we were able to contact a local Boy Scout Troup #1855 that was pleased to help us out. Nick Blue was in search of an assignment to receive his Eagle Scout badge. Nick took the project and ran with it. He contacted the local fire departments for fire hose (the material used to make the hammocks) that was donated and also was able to have the hardware donated by Home Depot. He made four weaved hammocks approximately 8’ x 12’ in diameter (which will probably be used by bears and lions) and two triangle shaped hammocks approximately 2’ x 2’ x’ 2’ for small mammals to snuggle in. 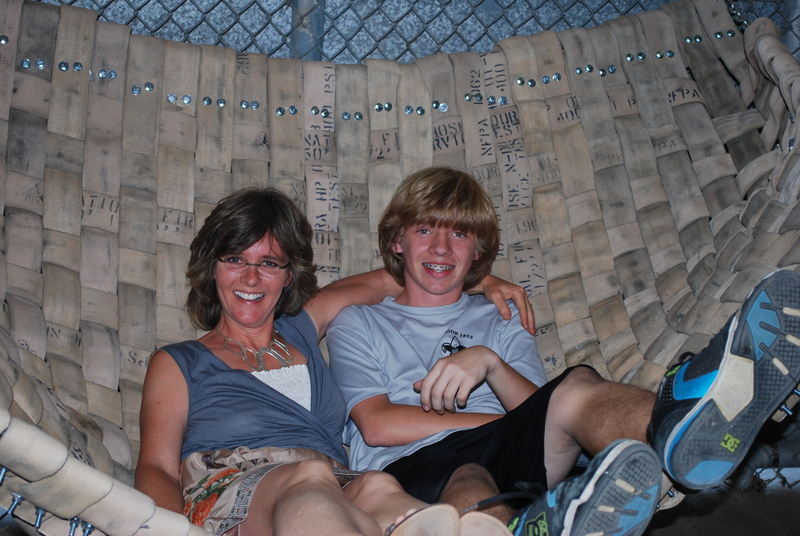 Big thanks to Nick from DFG and the animals who will use your hammocks! Lake Tahoe Wildlife Care called our lab over the weekend to report they had a coyote that had been found wandering in Strawberry, which is in El Dorado County. The veterinarian there examined the coyote and found unexplained bleeding around his mouth, which, when unaccompanied by signs of trauma, can indicate poisoning from a kind of rodenticide that thins the blood. Anticoagulant rodenticides are a tough issue right now. 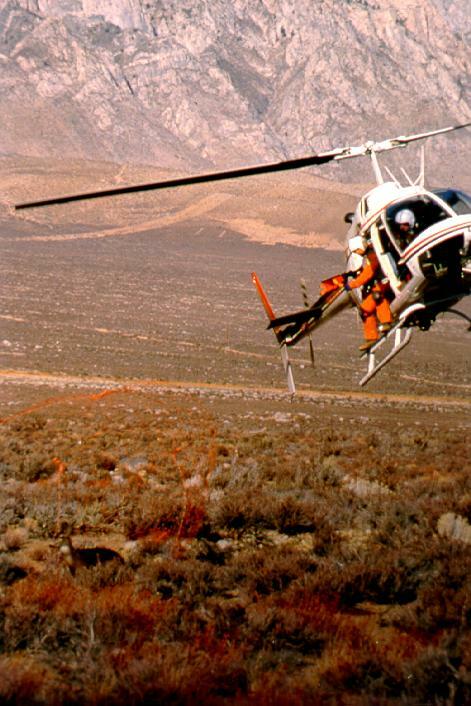 They are legal, widely used, and few users know the impact they can have on wildlife. Predators and scavengers get exposed to rodenticides when they eat rodents that have been poisoned. The veterinarian drew blood and confirmed that coyote’s blood clotting was impaired. The coyote did not recover and was subsequently euthanized. From Strawberry, the coyote was brought to our lab by Tom, the rehabber. The necropsy went as expected – lots of blood, both under the skin and loose in the chest and abdominal cavities. There were no broken bones. It appears that the animal was bleeding to death internally. We took liver tissue for our chemistry lab to examine. Monitoring studies reveal that the majority of predatory and scavenging wildlife in California are carrying residues of anticoagulant rodenticides in their livers. DFG would like to see the more persistent and toxic of these rodenticides restricted so they could be used only by certified applicators. It is one measure we can take to reduce our impact on wildlife in California. For more information on rodenticides, see http://www.dfg.ca.gov/education/rodenticide/. As the person who monitors pesticide impacts to wildlife in California, I am often grateful to the wildlife rehab volunteers. 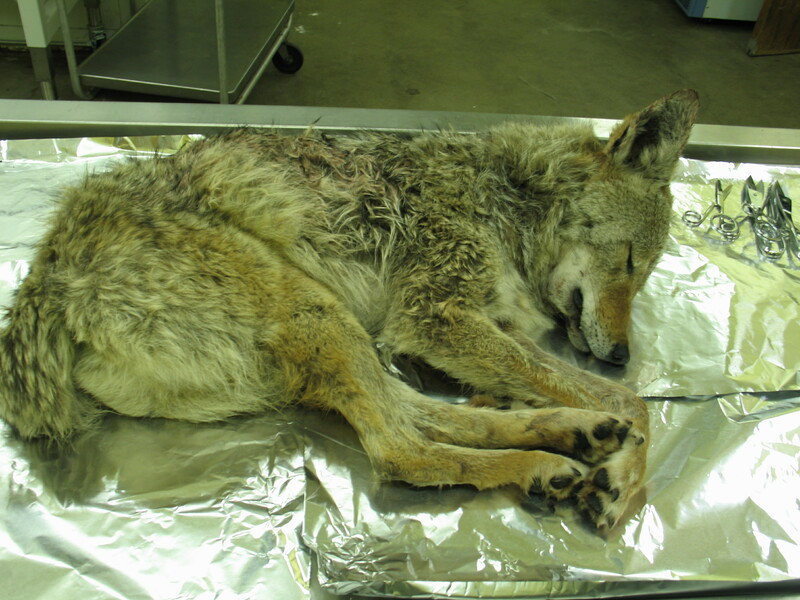 They are often the ones who call our attention to poisoned wildlife and will sometimes go the extra mile, as Tom did, to drive the coyote over to our lab so we can work on it. This is particularly true in the case of the anticoagulant rodenticide issue, where many of the animals we have diagnosed have been brought to us through wildlife rehabilitation centers. I’ll post chemical results when we get them back from the lab. The first desert kit fox (Vulpes macrotis) pup of the season receives a health exam by WIL biologists. The first desert kit fox pup of the 2012 season weighed in at a whopping 800 grams, or about 1.75 pounds. Deana Clifford, the WIL’s wildlife veterinarian for nongame, threatened and endangered species, and Jaime Rudd, the nongame wildlife health program science aide, are conducting examinations and disease testing on desert kit foxes in eastern Riverside County, California. 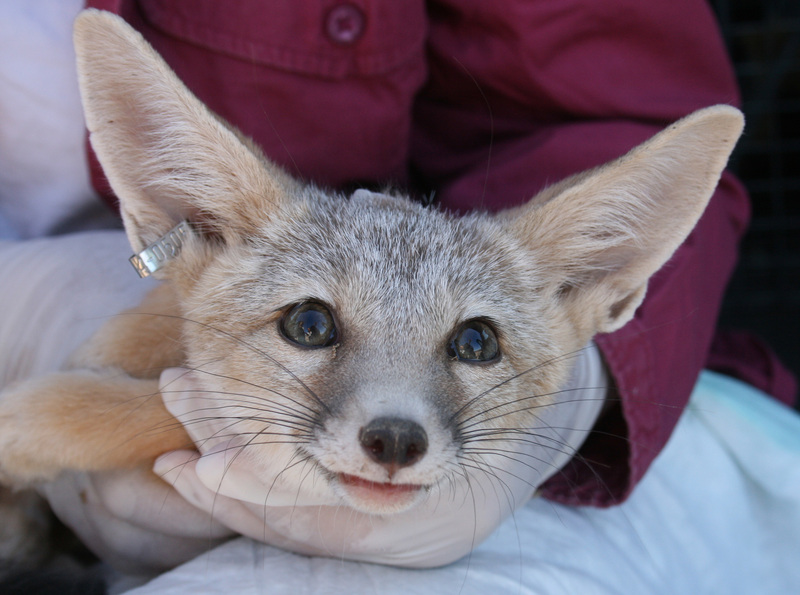 The exams and testing are part of a collaborative effort to understand the significance of an outbreak of canine distemper virus in desert kit foxes that started in 2011 (link to previous story). Canine distemper virus is a disease that causes respiratory and neurologic (brain) disease in both wild carnivores and domestic dogs. The virus can circulate naturally among wild carnivore populations but can also be transmitted between wildlife and domestic dogs. Therefore, it is always important to keep dogs current on vaccines. With the assistance of the U.S. Bureau of Land Management (BLM), regional Department of Fish and Game (DFG) and the California Animal Health and Food Safety Lab at UC Davis, the WIL is monitoring the health of desert kit foxes and trying to determine if the disease is continuing to kill kit foxes or spread to other areas. Foxes are also being monitored at and near the new, large-scale solar energy facilities in the desert. Biologists and project site staff are tracking and monitoring the survival of radio-collared animals through radio telemetry and the use of remote controlled cameras. We have just started our field work to assess the health of this year’s new pups born earlier this spring and to retest foxes we have been monitoring since January 2012. We will post more updates from the desert soon!